I’ve been an Alaska Airlines MVP Gold member for several years, and before that I earned status with other airline loyalty programs, too. I hope you’ll believe me when I say that earning status with Alaska Mileage Plan is one of the easier experiences I’ve had. It is different from the competition, but I consider it different it a good way. You’re probably familiar with award miles already. Airlines issue them. Credit cards issue them. There are lots of ways to earn miles for future award travel redemptions. But elite status is different. You need to earn a different kind of mileage, called elite-qualifying miles. A key advantage of Mileage Plan is that a mile flown is a mile earned, so you will always earn at least one mile for every mile that you fly on Alaska Airlines or Horizon Air. This is true for both award miles and elite-qualifying miles – and is in stark contrast to other programs that tie the number of miles you earn to the price of your ticket. Other programs may also impose a minimum spending requirement in addition to a mileage requirement. Alaska Mileage Plan doesn’t do that. You just need to focus on flying a certain total distance during the year. There is an option to earn status with elite-qualifying segments, not just miles. A round-trip ticket earns at least one segment in each direction, for example, and a connecting flight would earn more. Alaska Airlines is tracking all three of these totals in your Mileage Plan account: elite-qualifying miles from Alaska Airlines and Horizon Air, elite-qualifying miles from Alaska plus all partner airlines, and elite-qualifying segments. You’ll earn the appropriate status for whichever threshold you reach first. Take a look at my own progress during 2018 to see how this works. If I had counted elite-qualifying segments, I wouldn’t have earned any status with just 17 segments during the year. But for frequent business travelers traveling short distances, segments can add up quickly! You don’t need to travel on Alaska Airlines or Horizon Air to earn elite-qualifying miles toward elite status – you can fly one of their partner airlines. Thanks to travel on Alaska and partner airlines, including a spring trip on Emirates, I earned MVP Gold status with a total of 57,468 elite-qualifying miles. Alaska Global Partners include British Airways, Cathay Pacific, Emirates, Singapore Airlines as well as many others. You can earn elite-qualifying miles when you fly with many of these carriers and add your Alaska Mileage Plan number to your reservation. One thing to note: The rules for earning elite-qualifying miles are different on Global Partners, and the number of elite-qualifying miles you earn on partner flights will vary depending on the ticket you purchase. A complete guide for each partner airline is available so you can check how many elite-qualifying miles your ticket will get you before you buy. Any tickets you pay for using Alaska’s Famous Companion Fare™, a benefit of the Alaska Airlines Visa Signature® card, are also eligible toward award and elite-qualifying miles. That said, if your tickets are redeemed with award miles, you cannot earn additional award miles or elite-qualifying miles. In conclusion, Alaska Airlines makes it easier to earn status in several ways. The important thing is simply to keep flying to earn MVP benefits in 2019! The Alaska Airlines credit card program is issued and administered by Bank of America, N.A. Visa and Visa Signature are registered trademarks of Visa International Service Association and are used by the issuer pursuant to license from Visa U.S.A. Inc.
79 comments on "4 ways to become an Alaska Airlines MVP in 2019"
There should be a charge for suitcases that are carried on board. I get really tired of having to wait for people who put their suitcases in the overhead bins when they should be in cargo. The only thing I carry on board is my backpack and a single bowling ball. This is unfair to customers who check their bags. By “suitcase” I assume you’re referring to something that is over the 22 x 14 x 9 carry-on size limit bag. I don’t recall ever seen anybody get on the plane in a checked bag only size suitcase to put in the overhead bin. If that is what you’re referring to it seems like you could talk to one of the FA’s to have bag removed to checked luggage. Oh my Ardith, if you don’t do it then no one should. Ugh! Yes and I am fed up with being slapped in the head with a backpack. The backpacks should be carried in the front. Most of the time I sit in an idle seat 1 through 4. Many old and young alike turn to talk to someone and hit me in the head with their backpack. yes, there should. I get tired of waiting on them too. it would be easier for me as a disabled person, having to stand a long time waiting on those who have bags overhead. you would think it would be a safety item…security…no bags except handbags or a real small bag for laptop, kindle, etc. you get two free checked bags as a club 49 traveler.. we check all our bags and I saw on tv that you can ship for $10 if travelling or $40 if not. that way everyone would get off right away, no more getting hit on the head, etc. I had MVP or MVP Gold for over 20 years on Alaska Air and then Alaska said they had to eliminate their direct morning flight from Medford, Oregon to LAX and their evening flight and it would resume in about 8 months after more pilots were hired. Well that date has come and gone and still no direct flights to and from MFR and LAX. Well with that flight gone I lost my status now even though I was a loyal traveler. When will they resume the MFR-LAX direct flights? Also instead of getting to Puerto Vallarta injust over 6 hours it now takes many times two days to get there to Mexico because of this flight cancellation and you have to spend a night in Seattle or Los Angeles and really affects ones loyalty. Just frustrating and hope that you can start flying that direct flight between the two cities, again SOON!. I always found the flights to be 100% occupied or almost 100% occupied. When will those flight be reinstated as promised? 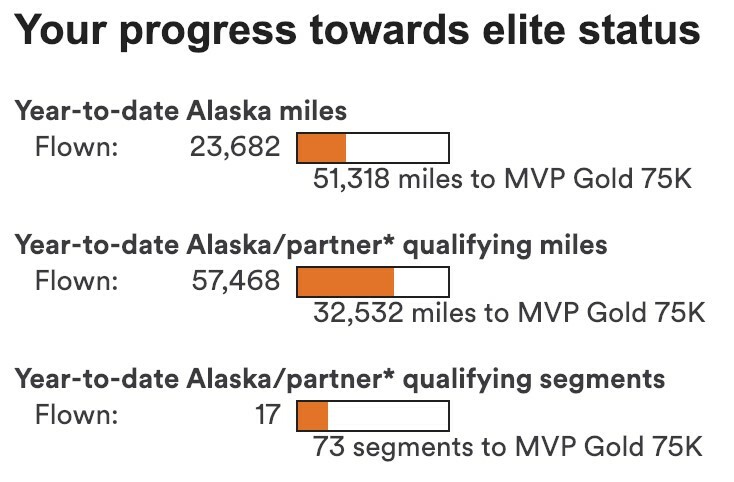 I don’t understand”elite-qualifying” miles and segments. Are not ALL miles and segments qualifying? How do you know if what you are booking are “elite-qualifying”? Hi Jan. All base miles and class of service bonus miles on Alaska Airlines and our Global Partners, excluding PenAir and Ravn, are elite-qualifying. Does that answer your question? As a devote Alaska member who won’t be reaching MVP status anytime soon, I’m really excited to see opportunities for the program to benefit non-MVP fliers in the future. I’ve structured an entire project for my MBA around these opportunities, which I believe would greatly increase member satisfaction and ultimately lead to market share growth. Please continue to investigate these customer-focused opportunities! Just a double-check to verify that trips purchased with a combo of mileage and money will count toward elite mileage for MVP status. Yes, trips paid with a combo of miles and cash will earn elite qualifying miles credit. One of my favorite earnings benefit. Please don’t ever change it! I’ve been an MVP Gold for the last 5 years, and am again for 2019. But, I’m not sure I’ll make it next year. The loss of the American partnership has really hurt my ability to get where I need to go on Alaska. Please, please, please figure out another domestic partner! When did the American partnership go away? I booked a trip to Europe with them 6 moths ago to take place in April counting on those miles. So I’m assuming with all of the recent unfavorable Alaska changes, that won’t be grandfathered either? I JUST changed my AMEX $250 airline fee benefit to American as well counting on that partnership. UGH Alaska is making it REALLY hard to maintain this loyalty…. International flights on American Airlines are still eligible to earn Mileage Plan miles. You should be able to earn miles on your Europe flight. I have been. gold 75K for years. I wish the guest upgrades and the gold 75 upgrades were more available. The flight choices are not great. It’s almost like a blackout times. If first class is available you should be able to use your gold 75k upgrades. My daughter received her MVP status about 2 years ago as part of a promotion at her university in partnership with Alaska Air for maintaining good grades. We just found out that her MVP status has expired at the end of 2018. Is there any way to reinstate her status? She’s a student and does not travel the 20K miles required for MVP. Thank you. Customer Care will be able to answer your question. They can be reached at 1-800-654-5669. Missed my 75K this past year by 3,000 miles which I was told I could pay $1,000 to close the gap…. $1,000! I’ve been so loyal for so long, I think its only fair to just give me the status…. Hi Audry. If you haven’t already, reach out to Customer Care at 1-800-654-5669. They may be able to help! Now that we are MVP can we upgrade our companion fare tickets. Even if we have to ay a little extra. Hi Melanie, MVP Golds and 75Ks are eligible for upgrades for themselves plus a companion. It would be nice if Mileage Plan shopping counted towards MVP. I was just shy of hitting it for 2018. Hi Marcela. While I can’t promise anything, there may be a couple ways you could still achieve MVP status. Just call Customer Care at 1-800-654-5669. I am a huge fan of Alaska airlines, however your credit card can be even better…I like that you allow a free checked bag if you are a credit card member, but checked bags should be free. The miles earned on the credit card should help toward MVP status. I would fly Alaska more but with my job there is a lot of unknowns and what keeps me from flying Alaska more is your change fee. If the credit card plan allowed for free changing of the flight, understanding there would be fare difference and that flight was originally paid for by the Alaska Credit Card, there should not be a change fee. I am kind of giving up on the MVP. I have been able to get MVP for travel but not my husband. When we use the companion pass for fun, I can’t get upgraded nor is my husband. I don’t really see the point because of this rule. I have purchased tickets to Oahu for Sunday but I would like to upgrade, how do I go about dong that? Hi Diane. Just give Alaska Airlines reservations a call at 1-800-252-7522. Do the new “Saver” fares count toward segments and distance? I’n not a fan of the new tiered and restricted booking options. Looks a lot like Southwest Air. Yes, they do. Elite flyers will continue to be able to earn elite-qualifying miles and be offered priority boarding on all fares. So when you fly using a “Saver” fare will you receive credits for distance and segments? If you purchase a Saver fare, you will be able to earn elite-qualifying miles and segments. I you are an MVP and you buy a “saver” ticket how many miles, bonus mile and or segments you get? Good question. If you buy a Saver Fare ticket, you will accrue miles at the same rate as you normally would as an MVP. Do Alaska credit card holders get free checked bags with saver fare? Yes, your credit card benefits are the same. I wish you could still use companion for first class. It takes forever to find an upgrade able fair then get on the phone to make sure here are first. Lass seats. We always fly first class and pay for those tickets isnshould be offered for companion as well. There may be a couple options for you since you were close to hitting 1 million miles. Just call Customer Care at 1-800-654-5669. If you could add a bunch more flights out of PHX that would be great. If Alaska joins OneWorld as a connect partner, perhaps we will resume our (domestic) accrual partnership with AA. That would be really helpful… I fly a lot out of PHX and would be happy to connect via SFO, LAX, PDX or SEA… but there are very few flights that even connect. Having a deal with another domestic partner like AA would really make a big difference. Especially if it was a good one like Oneworld where we can get upgrades and other benefits across. I was just a tiny bit short in earning MVP Status in 2018 due to a flight I had purchased that was cancelled due to dense fog in Seattle. After explaining my situation, the kind people in the customer service department at Alaska granted me MVP Status, which was clearly the right thing to do! I was very grateful and impressed by a corporate culture aimed at common sense kindness and being flexible to earn loyalty. I am a fan for life and am now booked on 6 Alaska flights already in 2019. Similar situation with me. Earthquake really messed up my travel plans and forced me to cancel a trip that would have given me my MVP for the year. They gave it to me anyway. I’ve already booked 20,000 for this year and it is just beginning. I fly one way from PDX to Cabo, Mexico and coming home I fly American Cabo/Phoenix/PDX and I don’t get miles on Alaska. Used to. You did’t mention using money and miles to earn elite miles. Tickets booked with miles and money are qualifying flights, similar to tickets that are booked with money only. The miles are redeemed in exchange for a discount on a regularly priced ticket. For example, 10,000 miles can be redeemed for a 50% discount up to a maximum of $100. How does the calendar date work with the MVP? Does it last a whole year, till the end of the year? How then does it add up? Hi Rj. You qualify for elite status every calendar year. But once elite status is achieved, you hold that status for the rest of the calendar year as well as the following year. For example, if you earn 40,000 miles in 2019, you’ll become an MVP Gold and hold that status through Dec. 31, 2020. In order to stay an MVP Gold in 2021, you’ll need to earn at least 40,000 miles in 2020. You might get lucky—a couple of times we’ve come up short, and received an email offer to earn the last few miles to MVP status early in the next year. Good luck! Hi Marggiory, there may be a couple options that you qualify for since you were so close to the mileage cutoff. Just give Customer Care a call at 1-800-654-5669. I enjoy Alaska Gold, but have given up trying to strategize with #3 above. I feel that the global partners intentionally mask which “letter/class of service” a particular fare is priced at before booking. So hey, Alaska Air, if you can offer any insight of how to VIEW that mysterious letter/class-of-service while shopping for fares on various carriers, LMK. I’ve found only 3 ways to do it: Call the partner airline customer service and see if they can help you book it on a letter/class-of-service that actually earns some/all miles on Alaska (I usually have to pay a nominal fee for booking through a telephone CSR) *OR* Have a travel agent book it (provide him/her with all the Alaska parameters for earning miles) and natch pay the travel agent booking fee *OR* Book it myself online and within the 24 hour refundable period, call the airline to find out which letter/class-of-service it is so that I can choose to keep the reservation or start over. This has become extremely burdensome and almost not worth it IMO. I’m finding it less and less attractive to pay for tickets on partner airlines to earn miles – so I fly Alaska Air as much as possible and then I use my miles to fly outside the Alaska network with the partners. I would love to learn how to view those letter/class-of-service online myself. Any suggestions? Hi there. Unfortunately, every carrier is different in terms of how they disclose fare classes. Generally, the information can be found when you are booking tickets on a partner airline site under the full “fare rules” or in “more information.” While not ideal, this information should be on each carrier’s website somewhere. yeah I feel the same! I went on a trip to china and was counting on getting more miles from it so didnt plan more shorter trips.. NOPE! lost my status for the first time in 4 years.. I had a similar experience, went to Europe in 2018 via Icelandic Air, and to my surprise, only earned qualifying miles on the Alaska Airlines Anchorage-Seattle portion. Lost my MVP status for 2019 by a couple thousand miles. My husband and I both have Alaska Air credit cards. We love the “famous companion fare” option. Alaska Air customer service is excellent also – well appreciated during Hurricane Olivia last September. I’m hoping an AS50 ticket still counts toward your gold status!!! Don’t worry, AS50 awards earn 100% of the miles flown as well as elite qualifying miles. Just wish it was as easy as you imply to earn credit on your global “partners”. We flew roundtrip from Seattle to London and your “partner” BA only credited us with 1/4 of the actual miles flown. Same for a BA flight from Athens to London. Some partner! We banked on those miles to continue our MVP status. I have experienced this same frustration many times, and (what I’m told by AlaskaAir) is the remedy is equally frustrating. In the Mileage Plan section of the Alaska web site, you can find how to “Earn Miles” > Airline Partners. There you find the codes expressed as letters, that tell you what percentage of your actual miles you can accrue to your Alaska mileage plan by flying the partners. That’s actually very clear. What is not clear is when you book a flight with those partner airlines which letter it is. Honestly, it feels sinister how concealed that vital information is. I can’t believe that your partner agreement doesn’t have some sort of requirement for how to shop that LETTER before purchasing a ticket. Please address that Alaska Airlines! Check out ITA Matrix by google, they will show you the class of fares when shopping for flights across all airlines. Well…I don’t fly that often, but I had three very lovely flight attendants on AK 1437 back from San Francisco on 12/26/18-one of whom was Carmen. They gave very good service, which certainly creates incentive to join the plan!